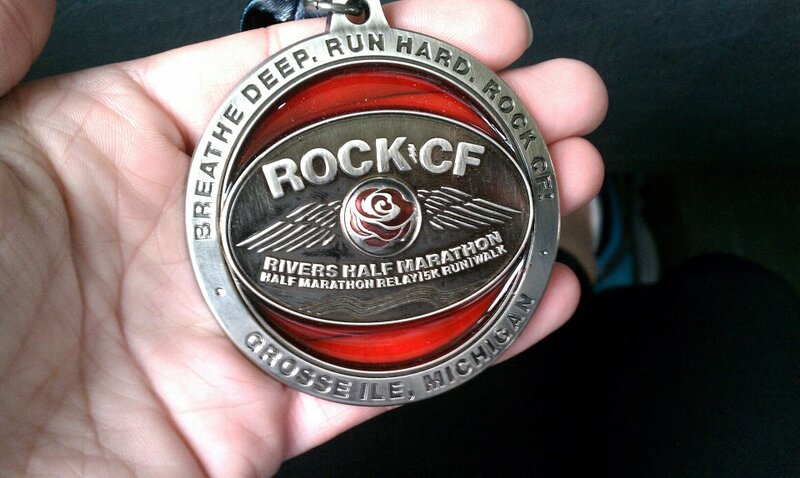 I ran the Rock CF Rivers half marathon in Gross Isle this weekend. It's a great and unique race. Every race has it's own vibe, and this event had an incredible and inviting feel. I'm not one for medals, but this medal was cool enough to look at twice. And the course was nice and we often ran along the water and then through rolling streets. I turned the event into a 18 miler by getting there early and running 5 miles before hand pretty darn slow, and then made my way to the start, got 3-4 minutes rest, and then took off with the rest of the crowd. I haven't done an event in a while, and two things always strike me when I go back. One is that the start of a race is such a sweeping, communal feeling. So much promise is in the air and the momentum of thousands of spirits launching is powerful. It has all the freshness of youth. Second thing that struck me is how, after an event, everyone is looking both their worst and their best. Yes, we are all slimy, especially when it's cold and there's just mucus coming out of your pores and you have that weird Marathon mojo all over your face. But despite that, nobody cares, because everyone's aura is shining and faces are smiling. Everyone has battled and bonded through the race course together, so all pretensions of the need to put on appearances has vanished. If only life always worked that way. Coolest part of this event was running through the Gross Isle airfield. We took a turn into a huge parking lot and Clowns were there to greet us. (Other runners saw the clowns, right? it wasn't just me. Hmmm, could be a hallucination, but I saw clowns). A band was at the hangar entrance, and Jumping Jack Flash was playing as I darted through. We ran through the hangar which was full of some wonderful little pond-hopper planes, out the other side, and then across the wide-open landing strip. It was unexpected and definitely put a charge to my getty-up. And you think I get my posts up fast. Haha. I loved the airport too. Also, my medal has green and not red in the medal. I didn't know there were different ones. Great recap. I love your descriptions. Great job on adding in another 5 miles! Spot on with your observations about the end of the race. The excitement and achievement just glows from everyone's faces. Makes me want to race again. LOL on the picture. Love it.